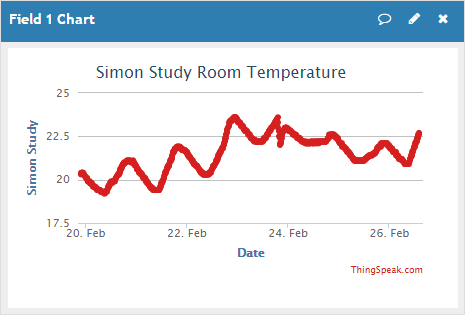 Finished the temperature sensors which I now have around the house. Used a protoshield for the Wemos D1 mini with the DS18B20 digital temperature sensor. Power is supplied via a powerbank which has two 18650 Li-ion batteries recovered from an old laptop battery. With the Wemos in sleep mode most of the time and waking every 10 minutes to do the measurement and then going back to sleep, I get about 18 days battery life. I originally tried a Xiaomi powerbank, but because the current draw of the Wemos was so low when in sleep mode, the powerbank would think there was no load and turn off, therefore not allowing the Wemos to wake up! Ended up getting some battery holder/charger from eBay and they work a treat. Also needed to solder a resistor between D0 and the reset pin to enable the waking from sleep. For the reporting/graphing, you can see the graph works for one channel, but I couldn’t work out how to get multiple channels on one chart. 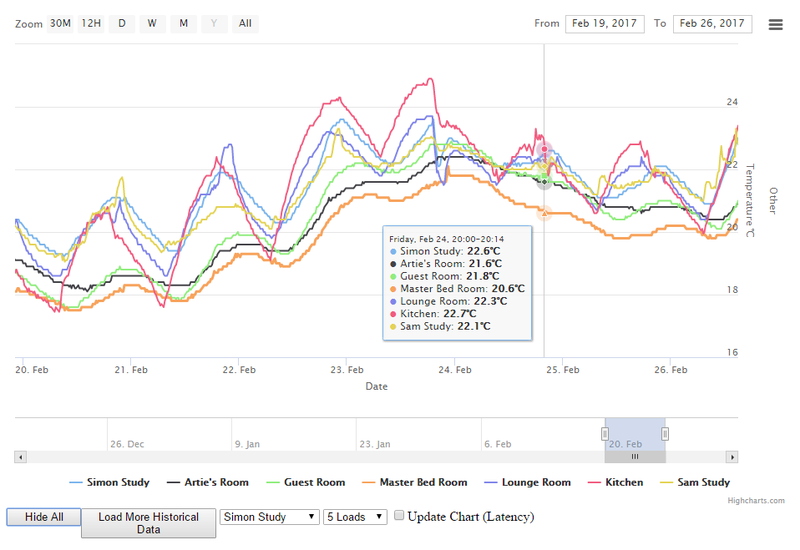 Did some googling and came across a solution that uses HTML, JS and the Highstock charts, which after updating a couple of details to use my thingspeak channels, it was running! Many thanks to the following people for sharing their code to make this project possible for me.